Tablw Nozad Tayib, a junior high school graduate Kurdish volunteer, was born in 1993 in Kirkuk and currently lives there in the Raheem Aawa district. Tablw lives with her five-member family which consists of her parents and three siblings. Her sister, Tania, is a sixth grade student and her brother, Towana, does not go to school. Tablw lived a difficult life of deprivation and pain, her father was a taxi driver and was barely able to make ends meet. My mother started looking for a job and was able to secure a teaching position in a kindergarten (Rose kindergarten) for a small salary. Through her work, she was introduced to the national institution through which she was able to meet INSAN. I was very impressed with INSAN’s work and started volunteering for INSAN after receiving training about human rights and peace, participatory research, conflict resolution, peacebuilding, and social communication. After the training, I became a member of a community committee. When I started working with INSAN it was the first time for me to work in an organization. I was very scared when I went to the center so I took photos of the way there. Still, this made me proud of myself and the confidence that I gained because of the work I was doing. The support I was receiving from the organization was the reason behind this confidence. 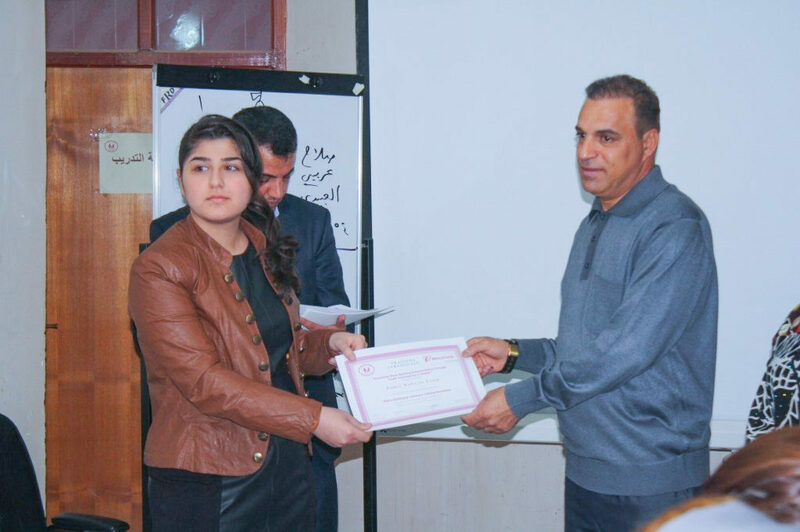 I was proud of my work and became a member of the Kirkuk peace ambassadors. I remained working with INSAN and they kept on refining my abilities until I was able to rely on myself. While working with INSAN, I was able to participate in many activities, like the society day (food day) activity, which INSAN held to support ties within the community and communication between the different sects and ethnicities within it. I also visited refugee camps and helped in organizing activities in Lylan refugee camp like hairdressing and tailoring events; I participated in peace and environment awareness campaigns like tree planting events and districts cleaning campaigns. Also, I was able to participate in an INSAN peace promotion program though children’s art called “ Peace Yard”, in collaboration with the Japanese JVC. 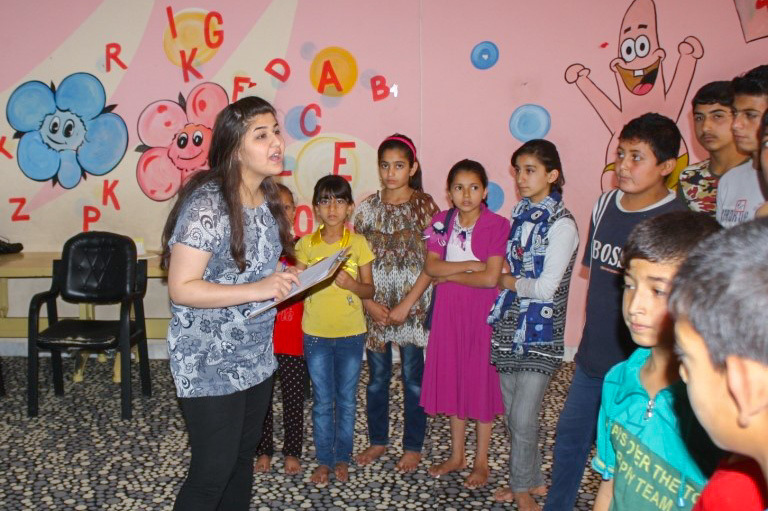 Working in Peace Yard and teaching children how to create art and handicrafts, and how to spread peace gave me a huge confidence boost, primarily through working with internally displaced children who were afraid of the police and security forces. I work with the displaced children on understanding the role of the police, army, and firefighters and the way traffic lights work through arts and colors. In 2015 my father had a brain stroke, and he became paralyzed and couldn’t work anymore. The only source of income was my mother’s salary which was not enough to cover all the family expenses and my father’s medical bills. That is when I started working; I first worked for the “Amal Organization for Advocating Children Rights” for a short while. Currently, I work for the international organization “TDH” in a small village near Toz Khormato and Suliman Bek as a researcher and children rights inspector. I want to thank INSAN for all the information and expertise to serve my community that I gained through volunteering for them. I’m very proud of my volunteering experience because by starting with volunteering I was able to develop myself to become a very confident woman. Now I can support my family and pay my father’s medical bills, I can take him to therapy and buy him medicine, and my family’s lifestyle and economic situation improved a lot. I genuinely want to thank INSAN and all its members for supporting other young people and myself and building our confidence.